Frank Densmore was one of the lawyers who represented Tom Hays, whose embezzling broke the Orange Growers Bank located in the building above. Frank E. Densmore came to Riverside in 1902 from northern California. Together with his half-brother Lafayette Gill, Frank established Gill and Densmore, a prosperous law practice. Densmore’s future in Riverside, however, became inextricably entangled with that of Tom Hays. The Los Angeles Times had broken the story that Hays had been involved in several crooked railroad deals buying property on behalf of the San Pedro, Los Angeles, and Salt Lake Railroad. Using railroad funds he had been buying right-of-way at one price and charging the railroad another, pocketing the difference. The Orange Growers Bank asked for his resignation. While Hays tried to explain away his $8,000 of fraud as commissions, others began to look closely at Hays dealings at the bank. The railroad and Hays sued and countersued each other. Tom continued with his lavish lifestyle, presiding over Elk’s Club events and celebrating the arrival of the railroad with a champagne party. On March 21st, the Riverside County Republic Committee felt compelled to announce that Hays was not resigning as chair and that the committee would stand by him. But it was all for naught. After presiding at a lodge meeting that night, Hays went into hiding. News had leaked that there was a large amount of money missing from the Orange Growers Bank and a run on the bank forced it to close at noon. Sheriff Coburn had a warrant for Hays arrest. For three days Hays hid amid rife speculation about his whereabouts. His wife and daughter were at their Ocean Park cottage having returned from a trip east. The Hays apartment at the Glenwood was vacant. The amount of the embezzlement was reported by the Los Angeles Times at $100,000. Finally Hays sent word to Coburn that he would surrender if his case were transferred to the courtroom of Superior Court Judge Joseph S. Noyes. In 1900, Hays had been instrumental in Noyes re-election over his opponent John G. North, son of Riverside’s founder, in a bitter contest. On March 24th Tom was charged with embezzling $5,000 and bail was set by Noyes at $10,000. As three more indictments were filed, bailed was raised to $40,000 despite Hays’s protests. Judge Noyes was, in the meantime, lambasted by the Los Angeles Times for contributing to the lack of an indictment for Hays involvement in the railroad fraud. Others who came in for criticism included Riverside County Clerk. W.W. Phelps, C.W. Craven, P.T. Evans, and District Attorney Lyman Evans. An editorial on March 28th caused Noyes to sue the Times for libel, a suit he later dropped. Phelps sued and won and the Times issued an apology to Lyman Evans. On March 30th, in Judge Noyes court, Tom pleaded not guilty to a total of five indictments for embezzling. His lawyers were Frank Densmore, Eric Gill, and Miguel Estudillo. 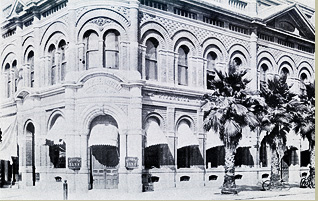 The Orange Growers Bank was a national bank, and as a result the federal grand jury in Los Angeles took testimony. On May 6th, Hays again appeared in Noyes courtroom where, state charges dismissed by Noyes, Hays was handed over to be arraigned in the U.S. District Court in Los Angeles. There Tom’s luck changed and he was released on $30,000 bail. He would not face trial until April 1905. Tom’s brilliant defense attorney in the federal trial accused others associated with the bank of prosecuting Hays to hide their own guilt and discredited Noyes on the basis of unreliable testimony. The dispassionate but factual arguments of the prosecution failed to move the jury and they voted 9 to 3 for acquittal. Eventually Hays was tried and convicted on a fraud charge for his railroad dealings and the last of his Riverside property was used to pay a portion of the judgment in June 1906. On August 17, 1906 Judge Noyes suddenly resigned. Frank Densmore was appointed to serve out the remainder of Noyes term. That same year he planned his new home. It was constructed by G. Stanley Wilson at 4567 Mission Inn Avenue, on a lot in what had been Hays’ Rubidoux Heights Tract. In November 1906, Densmore was elected judge, and was reelected in 1912. In 1913, Noyes committed suicide in Pasadena. In 1916, Densmore was killed by a sudden heart attack at age 47.